In acoustics, decibels are used to indicate the loudness of a single sound in comparison to a fixed reference sound. This reference is the quietest sound audible to the healthy human ear – roughly equivalent to the sound of a mosquito flying 3 m (10 ft) away. This is called 0 dB. The reason for using decibels as the measurement system for loudness is that our perception of loudness corresponds to a logarithmic curve rather than a simple straight line. Increased loudness is caused by increased air pressure, the consequence of which is that sounds approaching 125 dB will begin to cause pain and sounds over 180 dB will cause damage to the hearing tissue. Because changes in air pressure alter our perception of loudness, the term dB (SPL) is normally used, meaning 'decibel sound pressure level', in order to distinguish it from other dB measurement. The human ear, however, is more sensitive to high frequencies. Noises above a' have a greater impact on the ear than those below. An additional method of dB measurement takes this into account, altering higher-pitched sounds slightly upwards to give a truer indication of the effect they have on the ear. This measurement is known as dB (A-weighted). Other qualifiers are used to indicate what property is being compared, such as dB(A) and dB(v). For example, one might talk about a signal-to-noise ratio of 80 dB(v). This would be a comparison between the amplitude of the signal (which we want to hear) and the noise (which we don't). In this case, the signal voltage becomes the reference point (whatever the actual value was) and would be called 0 dB(v); the noise voltage (whatever the actual value was) would therefore be 80 dB(v) smaller. The logarithmic nature of the decibel allows us to compare two values of enormously different magnitudes with conveniently small numbers. For example, the limits of hearing in terms of absolute pressure level cover the range from 20 μPa to 200,000,000 μPa, making calculations in these terms tedious. 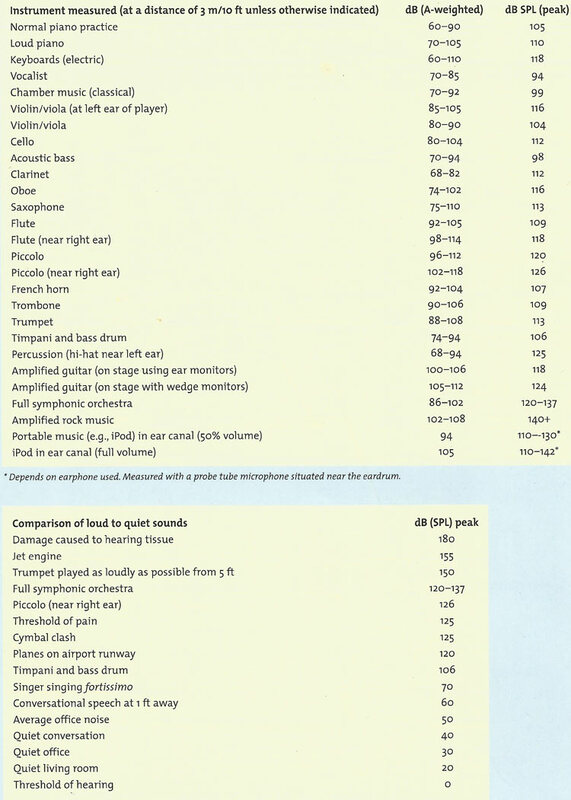 The same range expressed in dB SPL is 0–140 dB SPL, which is much easier to handle. The unit is named after Alexander Graham Bell. One decibel is a tenth of a bel. Decibel level alters dramatically with distance and if there is interference from other noises. A string section in a symphony orchestra, for example, is not 45 times louder than a solo violin. It should also be remembered that any instrument can be played so quietly that it is inaudible – it is only in the upper levels of loudness that a limit is reached. Most of the measurements shown in the table below were taken at a distance of 3 meters (10 feet). Some, however, were taken next to the ear of the musician, which is particularly significant in terms of instruments such as the piccolo and flute. It should be noted that different playing styles and different instruments will give different results; these figures should be regarded as a general guide only.